Carbon Monoxide (CO) is the product of combustion from fires and combustion engines. Zane's home was all electric and the pumps running were 5 electric submersables; the windows were open front and rear. No CO was found at the home or in the blood of the family. 1. The claim Zane died from a normal level of Carboxyhaemoglobin is the same as saying all people are dead. People on Oxford Street and Smokers have more than twice the carboxyhamoglobin levels of Zane. Twice the level is also not toxic to human beings. 2. What is carboxyhaemoglobin - It is not a measure of carbon monoxide, indeed we know there was none. It is not possible to measure carbon monoxide in blood; carboxyhaemoglobing is a proxy carboxyhaemoglobin is produced by all people in their blood cells. Hydrogen cyanide is one of the fastest acting poisons known to man; it stops all blood cells joining to oxygen and destroys the central nervous system. 3 Hydrogen Cyanide - The gas used in WWII concentration camps to kill people. 2ppm and above kills people. 4 Zane's father diagnosed paraplegic due to Hydrogen Cyanide Poisoning. Zane was only 2m from his father. When people speculated in newspaper articles they wrote it was carbon monoxide because there were 'fumes from a petrol pump that was in use', yet there were no fumes, and no petrol pump was ever on thereby destroying the whole premis of their CO claim. In addition Zane's Victorian home is all electric and used electric pumps; carbon monoxide is in fact impossible, hence there was none. We do not blame the speculators, even though their acts caused people to attack Zane's parents as child killers. The speculators were not told "25,000ppm Very High Readings of Hydrogen Cyanide was found throughout Zane's home the morning Zane died; as read out in the December 2015 coroner pre inquest hearing ref the National Emergency Incident Logbook which states the 25,000ppm Hydrogen Cyanide went straight to an Emergency COBRA meeting for matters of National Security on the same day Zane died, the incident was that significant and urgent (7/7 was one of the last previous Emergency COBRA meetings). The Logbook refers directly to information being redacted so the public would not know what happened as read out at the hearing. Authorities know ‘It is easy to fool the public, and it is far harder to persuade the public they have been fooled’. Just imagine how you would feel if this happened to you. Those that were there that night all confirm the petrol pump was off. People that were not there fabricated the pumps were on claiming petrol pumps and generators were on for days and willfully misdirecting their expert witnesses prepared to work on heresay. Fact - There was no CO, no petrol pump (90 decibels) on; as evidenced at the outset, no carbon monoxide in anyone's blood, CO tested none detected multiple times, medical, scientific & data fact. Fact - All the family's symptoms are as Hydrogen Cyanide poisoning; medical records for the family within the first minutes state hydrogen cyanide. Fact - When CO poisons people they may be ambulanced to hospital, and return home the same day, the offending appliance is swithched off, the house ventilated and the home is ready to use the same day. In blocks of flats the neighbours are not even evacuated. Contrast this with what happened to Zane's family where special incident detection teams were called in, hydrogen cyanide was detected on specialist equipment, an inner and an outer cordon was placed, the area evacuated for weeks, a bridge closed off, DoH authorised ambulances to take people to hospital, pop up hospital, Hazardous Area Response Team, decontamination of emergency services, Zane's home uninhabitable for over a year unfit for purpose unless gas proofed. The above is relevant because it is claimed by some authorities Zane's mother and father made up the hydrogen cyanide and the landfill; they believe it is claimed. In fact Zane's daddy was in cardiac arrest and his mummy was seriously ill in hospital, they did not use the cyanide detection system, nor write their own medical records, nor made the landfill themselves from 1936, and they certainly did not instruct Emergency COBRA meetings etc etc. Claims that 'Zane's parents believe it was hydrogen cyanide' are an effort to discredit independent facts; and the truth. 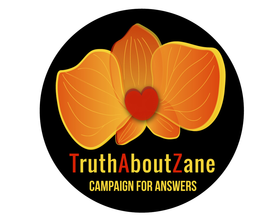 In actual fact Zane's parents have only ever asked for answers through proper, full, and fearless investigation; as the law should require. In the meantime Zane's parents face some state authorities that say forget the independent and corroborated facts, believe our fabricated hearsay that the family were running petrol generators and pumps! These are simply factually incorrect and made up. Never forget this is all about an innocent child; Zane, who died when Hydrogen Cyanide infused his home; one of the most deadly toxins known to man, and those authority's that are there to protect Society could not care even to investigate. WHY? ZANE SHOULD STILL BE ALIVE TODAY. HE IS LOVED AND DESPERATLY MISSED BY MANY. CO does not travel from one home to the next, it certainly does not travel to 17 other properties necessitating evacuation, closing of a bridge, or a public health warning. Or even a contamination area set up in the local hospital. This is what happened on the day. The usual response to CO is to open the windows (these were already open) close down the offending appliance (no appliance was on) and move in and use the property the same day (today the family can not go home due to gas activity in and around the house). It should be noted that even in flated developments if a boiler were defective and emitting CO in one flat, the neighbouring flats do not need to be evacuated. The universal measure of how much CO is in blood is called Carboxyhaemoglobin established by simple blood test. CO in blood remains stable after a death for years, and in blood samples for over 3 years. A person requires 12 hours constant exposure to CO in a closed room with a CO leaking appliance to get to 12% carboxyhaemoglobin levels. In metropolitan areas people live with levels of 15% to 17% in their blood. At 30% to 40% CO in blood it can cause headaches and fluelike symptoms. At elevated levels of 60% to 70% unconsiousness; and if the person remains exposed for several hours further at 120% a person might die. The family had single figure levels typical of local suburban levels and their good health. Research states at 10% Carboxyhaemoglobin there is no appreciable affect on health. Research states 15% is not an unusual day to day level for people to have in their blood. Many would appreciate a person can not die of a substance not present.